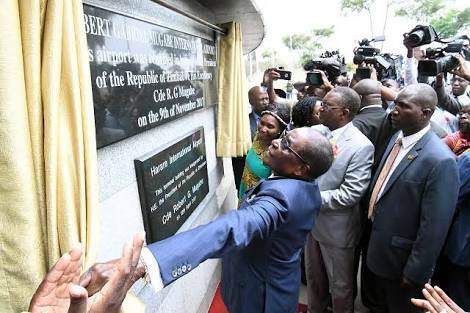 Expansion of the Robert Gabriel Mugabe International Airport will begin anytime with construction equipment now on route to the site as Government last week gave legal backing to a US$153 million loan secured from China recently. The loan facility from Export-Import Bank of China was secured during President Emmerson Mnangagwa’s recent State visit to China. Finance and Economic Development Minister Patrick Chinamasa made the announcement of the approval of the loan by Harare through a Government Gazette published on Friday. During the high-level visit to the Asian country, Government secured several multimillion-dollar deals including immediate funding for Hwange Thermal Power Station’s Units 7 and 8 and NetOne’s Phase 3 expansion. Harare is also set to receive the first tranche of the US$1 billion Hwange deal any time for the project which will be implemented over three-and-a-half years. Already US$10 million of the US$71 for NetOne’s expansion has been released with the remainder set to be disbursed progressively. The country also received a US$20 million package to help ease liquidity challenges. Since the visit, several delegations from the Oriental state have travelled to Harare to follow up and concretise some of the agreed deals. Minister Chinamasa signed the airport expansion deal on behalf of the Government. The expansion project will be undertaken by Chinese engineering firm, China Jiangsu, the same company behind the successful upgrading of Victoria Falls International Airport. Transport and Infrastructural Development Minister Dr Joram Gumbo said all was set for the airport expansion project. He said: “We have completed the preliminary stages which involved negotiating and signing of the deals. “Now that the deal has been gazetted it means work will start any time from now once the money has been released to the contractor. “But the bottom line is that the project is starting now. “I understand that the contractor, China Jiangsu, is in the process of moving its equipment from Victoria Falls where it was used for the expansion of the airport there to Robert Mugabe International Airport where they will start work soon. “Everything, including the designs, have been done including the prerequisite soil tests. The expansion of Robert Gabriel Mugabe International Airport will increase the facility’s capacity from handling just over two million travellers to about six million annually. The Sunday Mail understands that the extensive facelift will include modernisation of facilities at the airport, with the car park set to be transformed into a multi-storey facility that can handle hundreds of vehicles. Modern airport bridges will also be installed at new gates while the runway will also be expanded further to allow for multiple landings at the same time. Currently, only one airplane can land at any given time. Technology will also be upgraded with a new radar system being deployed.